يطل فندق Bay Motel على خليج Halfmoon في جزيرة Stewart، ويقدم مناظر بانورامية من بحر Tasman. ويضم ملعب الجولف بالجوار وخدمة نقل مجانية ومواقف خاصة ومجانية للسيارات على الموقع. جميع الشقق الحديثة تشمل منطقة للجلوس مع القنوات التلفزيونية الفضائية ومطبخاً مع ثلاجة وميكروويف وأدوات تحضير الشاي والقهوة. كما تضم الغرف شرفات خاصة، تطل معظمها على الخليج. ويمكن للضيوف استخدام مرافق الغسيل المشتركة. وهناك أيضاً منطقة للشواء في فناء مغطى. يبعد فندق Bay Motel مسافة 5 دقائق سيراً على الأقدام عن المتاجر والمطاعم؛ ويتيح موقعه إمكانيات عديدة للمشي لمسافات طويلة والرحلات في الغابات البكر في Rakiura National Park. Please note that Bay Motel does not accept payment with American Express. Please note that there is a 2% charge when you pay with a credit card. Payment via bank transfer or EFTPOS is available. Helpful, friendly people, lovely position and view. Pickup at ferry wharf and shuttling around the village was much appreciated. Rooms were clean and very nice. A great place to stay. The owners are so friendly and helpful. We had a fabulous welcome when we arrived on the island. Nothing is a problem for them. They organised a trip to neighbouring Ulva for us, taking us to the boat and collecting us when we came back. The accommodation is perfect - very roomy and with all that you need for your stay. I would definitely recommend this motel to anyone who values good service. Fantastic welcome with quick tour around the town by Jeff which was really appreciated. Room lovely, great views and warm. Will recommend to all! Hosts were fantastic and provided many extras not expected like pickup and drop off at ferry, and custom services and information. central location, clean modern and spacious. would reccommend. The weather conditions can change we where stuck when a gale force winds held up the airport. We stayed 3 nights to do some bird watching. Hotel staff are very accommodating and dropped us off at the pier to board the boats, as well as picked and dropped us off for the ferry to Oban. It is only a short walk to the shops and food. The room is equipped with a stove, microwave etc ... quite adequate to prepare simple meals. We were in room 7 - not quite a sea view, but very pleasant looking out at treetop level. 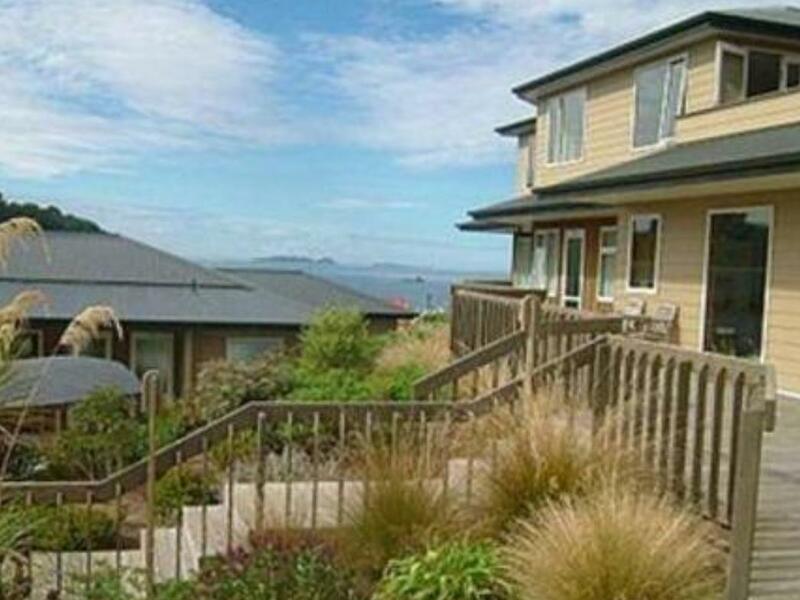 And you can still see the sea from the shared verandah. 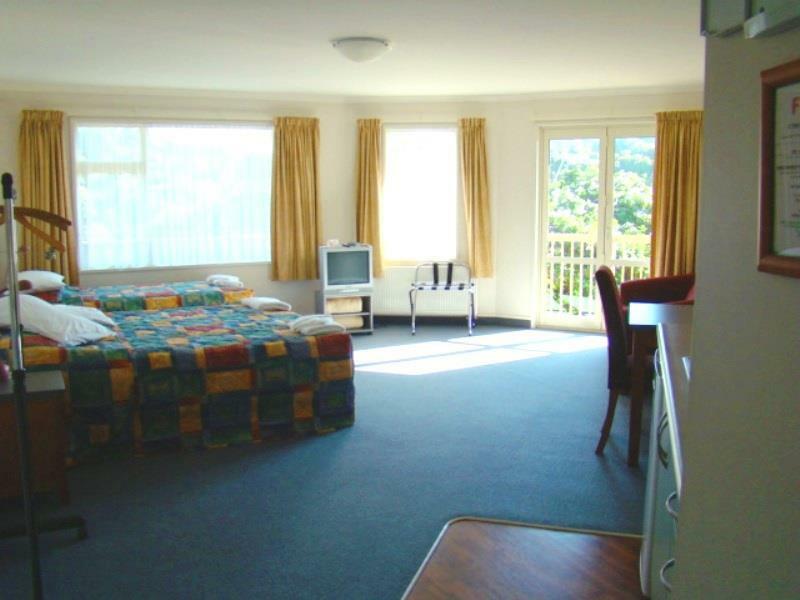 The shared verandah does mean that you would need to draw the curtains during busy periods. Great we had a wonderful time, we visited Ulva Island having been transported there by water taxi. Ulva Island is a must do if you go to Stewart Island. We walked all the tracks and spotted most of the birds, they were a little shy the day we went over, the weather was overcast and a little gloomy. 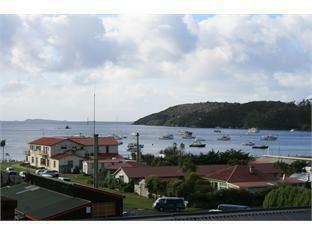 Great location, large room, large bathroom and excellent compact kitchen area. I really enjoyed my stay here. The manager did his best to ensure that everything was in order, although he was clearly under a fair bit of pressure, time-wise. The situation was good. Only five minutes walk from most areas of the village. Great food in the local hotel, and lots of lovely walks from the hotel. The view, the clean and spacious room and comfortable bed, and useful tips for sightseeing and meals. We had a very enjoyable stay at the Bay Motel and wish we had planned to stay on Stewart Island longer than the two nights we had. 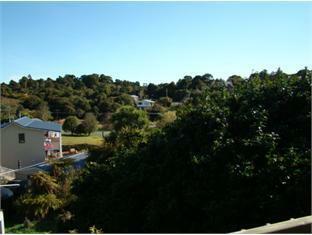 It was a comfortable base at a reasonable price and we really enjoyed visits from the kaka on our balcony. Breakfast was supplied to our room which was useful but it was rather basic. Personal pick up and guided tour of town ameneties on arrival. Advising and booking activities all payable on check-out. Delivered luggage to our departure point!! Pick up at the ferry. Lovely rooms. Alovely stay. Good advice re tourism, eating places, walks. We were picked up at Stewart Island ferry terminal which was very welcome. All the staff we met were friendly and helpful. We had a wonderful view over the harbour. picked up from the ferry and rooms were nice and clean. great bbq area. would recommend. The staff of the Bay Motel picked us up at the boat and gave us a lot of information about the small village( showed us around on the way back to the motel). 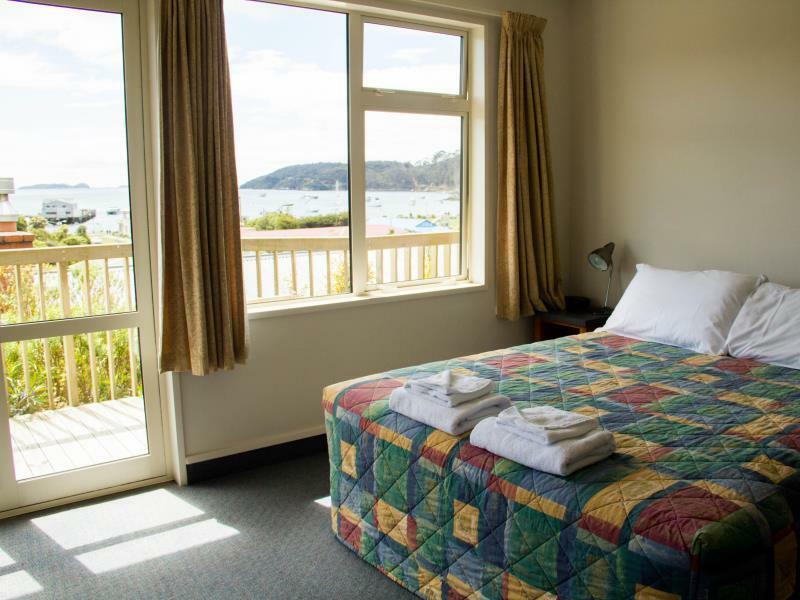 The rooms are spacious and many have a view of the bay. The keas ( parrots) will come and eat nuts from your hand on the balcony - lots of fun! The motel will arrange tours, take your luggage back to the peer and are generally helpful. I would highly recommend the Bay Motel! Well appointed hotel in Oban township. You will be met at the ferry port and taken on a tour of the town. Rooms large but oddly have frosted glass meaning the light floods in in the morning. Loved our stay at The Bay Motel. Definately recommend it to anyone.